Recently I was commissioned by architects to supply 4 large photos in a Dublin Residential Development. It was a new and refreshing approach by our client, which I have not previously experienced in Ireland. I like most people live in an urban environment. I currently live in the same apartment since 2008. I barely know my neighbours. I barely know anyone’s name in the complex. Occasionally our paths meet in the lift or on the Landing. This usually involves a bit of small talk. Of course I’m Irish so somehow the weather always sneaks it’s way into our brief conversations! Beyond that, there are no interactions. We know pretty much nothing about each other. This is in stark contrast to my earlier youth, growing up In County Sligo. Some of my best and oldest friends were my neighbours. But what was the fresh approach. The owners of a Residential Development in Central Park, Leopardstown decided to create a really cool communal area where the residents and tennants could interact and actually get to know each other. There is a gym, chill our area, a work area (if you must), a games room with fussball, games console, snooker table TV area and a children’s play area. Even a large kitchen and dining area where groups of people could come together over a meal. I was so impressed with our client’s approach. Of course it makes perfect sense from their point of view. It would be a huge incentive for new tenants and owners to choose this property and it brings a little humanity into the daily lives of the inhabitants. It’s so easy for people to feel lost in a city. I believe this is something very positive which can only be encouraged. In addition to providing these facilities, the client also decided to display a number of art pieces around the common areas. Having photographic art or any art for that matter around you greatly improves the quality of life in the workplace or home. Included in their selection were 4 of my my Photos. All were large pieces, printed on Durst Lambda Photographic Paper and mounted on high grade scratch resistant Acrylic. 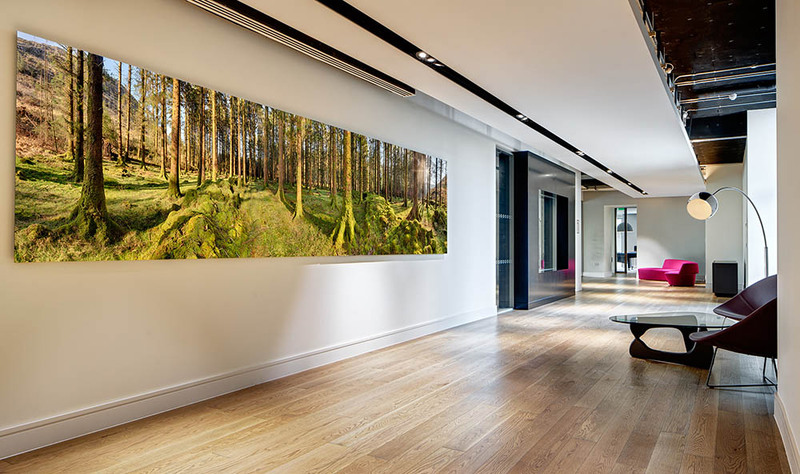 The largest image was a 5 x 1.2m high forest panoramic photo of the stunning Gougane Barra Forest Park. At this size you are transported to the scene almost as if you are there. A perfect piece for it’s chosen location.